If you are a serious athlete, and intend to play your sport in college, it’s hard to pick a topic for your college application essay that’s not related to your sport. Chances are, this sport has consumed much of your life for at least the last four years. Ironically, that is why you should do your best to find something else to write about in your college essay. They want to know what else you care about, how you think and what you value–besides sports. In your college application, it will be clear that you care deeply about your sport and excel at it. So you really don’t need to focus on that any further. You do not need to strut your stuff in these essays. Humility goes a long way. For help finding other topic ideas, check out my topic brainstorm guide or my tips on summer jobs as topics or how to find a topic if you don’t think you have anything to write about. Pick a quality that you want to highlight that you feel makes you effective at your sport. Then find a story or examples of this quality outside of playing your sport. Example: You are a leader when you play water polo. That’s great. But think about some other area in your life where you have developed leadership qualities. Try to find a time when you encountered a challenge, obstacle or problem that forced you to step up as a leader. Search for examples in your classes, or in a summer job, or with your family or something else you like to do. Write your essay telling about that experience, and if you want, mention how those leadership skills also come into play in your water polo career. This way, you have shown that you are a rounded individual, but that all your strengths enhance your favorite passion–water polo. You can use this approach for almost any sport–dance, volleyball, football, track, baseball, etc. Just look for a quality or characteristic that is central to who you are, and find other places where you have used or developed it–outside your sport. Here are some possible qualities–passion, discipline, supporting role, team player, funny, determination, patience, timing, control, flexibility, originality, ambition, strength, focus, speed, endurance, drive, humility, on and on. Think about how some of your strengths in your sport have a figurative side, something you could spin into a metaphor. Football: You are a defense guy on the team. Your job is to always protect the quarterback and help him succeed. Do you play this role in other ways in your life, say, with friends or family? Or maybe you are the opposite in real life, and take a more offensive role. Why is that? Do you like that about yourself? Dance: You are all about movement and grace and self-expression on the dance floor. You are super disciplined, almost to a fault. Are there other parts of your life where you let down your hair? That could make an interesting essay. It’s unexpected. That a ballerina also loves Hip Hop and Rap. See if you have a passion that is the opposite of what people might expect of you–and Boom, great essay topic! Track: You run the 100 meter dash faster than most people. Are there any parts in your life where your speed has served you well? Or, maybe take the opposite approach–are there times when you find it’s best to go slow, and be deliberate and smell the roses? Why is that? 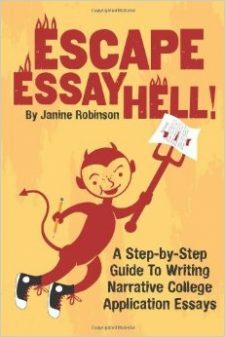 Could be a good essay. Just give an example, and then share how you think about it. Flexibility: As a gymnast, you are super flexible, physically, literally. But how flexible–in a figurative sense–are you in other parts of your life? Has your literal flexibility affected your figurative flexibility in any way? How? Is it a good thing? Why? Endurance: In cross country, you can run forever, and how to pace yourself. How do you pace yourself in other areas of your life? Why is this important? How did you learn this? Discipline: In baseball season, you workout daily at 6 a.m. at the gymn, or run the hill five times a week to get in shape. But it also can mean good study habits or making time for other things you value. Were you always self-disciplined? How did you learn this life skill? Is it possible to be too disciplined? Is there any area in your life where you break your own rules? Powerful: You can kick the soccer ball into the goal from across the field, but how powerful are you in your relationships with friends and family and others? Control: You are amazing at getting the golf ball in the hole, but how do you control other things in your life. What have you learned in other areas about the nature of control–maybe, sometimes you have to understand you can’t control everything? Good Timing: This can mean everything in many sports. Chances are you have good timing in your sport. But are there other areas in your life where your timing has been off? How have you dealt with that? Is it sometimes okay to have bad timing? Hope this has gotten you thinking! If you have an idea you like, take a stab at it and write it up. Chances are, it’s good stuff!